Just connect OptiPic to the site and the compression of all site images will start automatically. It's that easy and effective! Search systems prefer speedy websites with optimized performance. 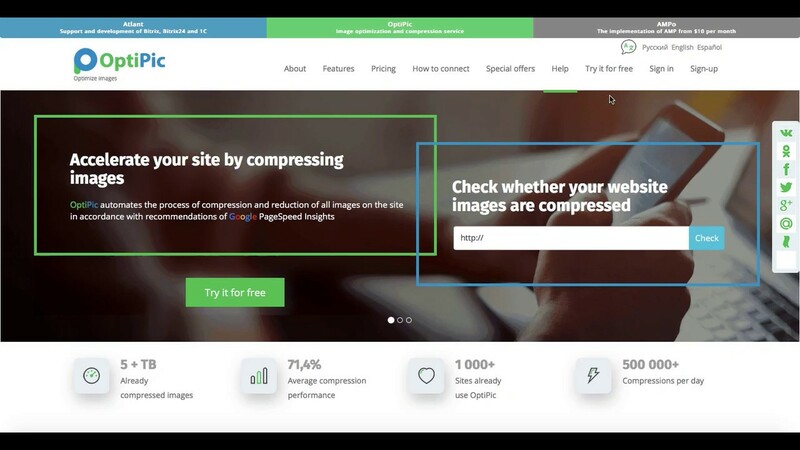 Bring your site one step closer to the Top list with image compression. Free of charge and registration! All known CMS and frameworks, as well as self-made sites in PHP are supported. Connect our module to your site and it will find and compress all the images on your site. Download Optipic to your site and the service will automatically find and compress all images almost by itself. This will speed up your site. Thus it will improve conversion, raise the attractiveness of your site to the visitors who won’t need to wait too long and forward your positions in Top. Are you working on developing and maintaining websites? Introduce OptiPic to your customers and managers and earn with us. Connect all your sites to OptiPic and get plenty of spare time for more interesting tasks. Join our affiliate program and promote Optipic to your customers’ sites. It will speed them up and get them promoted. Your passive income will be a bonus for you. Do you often deal with large images of several MB? Use OptiPic to compress images online for free. This will save space on the disk or any external storage.